Mumbai, Embassy, Apostille, Certificate Attestation, Mea, HRB » Blog Archive » Certificate is to be Apostilled or Attested From Mumbai? An Apostille is the legalization of a document for international use (only in the member countries of the Hague Convention) . On October 5, 1961, many nations joined to create a simplified method of “legalizing” documents for universal recognition. This group of nations is known as the Hague Convention. They adopted a document referred to as an Apostille that is internationally recognized by all member nations. To determine that a certificate is to be Apostilled of Attestation is depends on the rule implemented in the respective country of the issuing University and the Country in which the certificate is intended to use. If the certificate is to be used in the country which is the member of Hague Convention, the document should be apostilled from the issuing country. If the certificate is issued from the Hague Member country, and need to use a non Hague member country. the certificate should be attested from the Embassy of the issuing country. 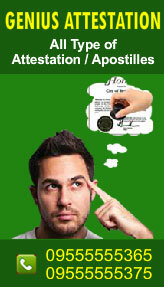 Apostille is a certificate attached with the original certificate. All the authentication process is done on this separate Apostille sheet. It shows that the certificate is genuine. And the person who signed in the document is the Authorized person of the Organization. In 1961, some countries agreed to be the member of the Hague convention.